Modern. Sustainable. Modular. 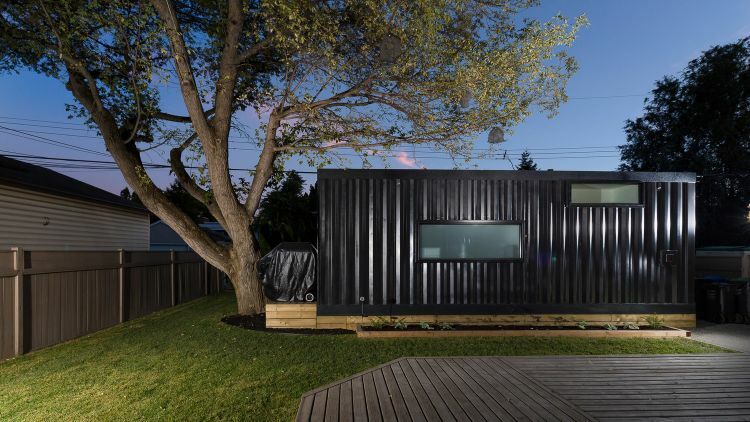 That's the motto behind Honomobo, the company that designed this shipping container home called the HO3. 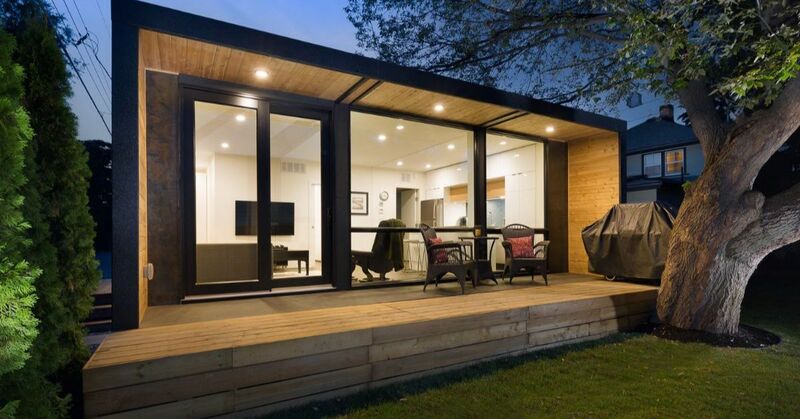 The home is actually three shipping containers melded together to create an intimate home with an amazing view. 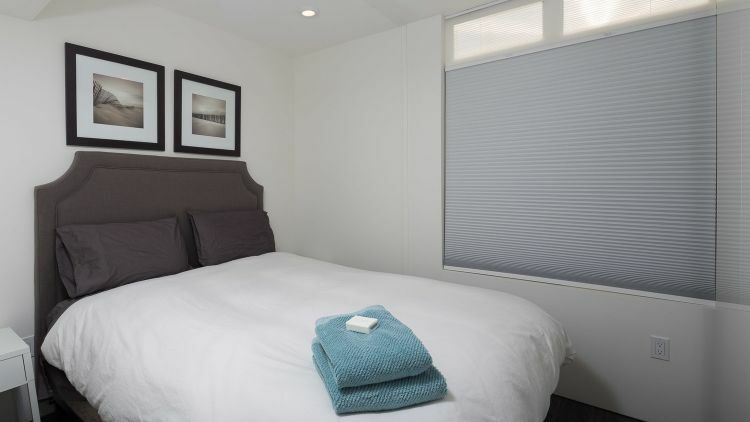 It is comfortable without feeling confined and feels roomy without excess square footage. 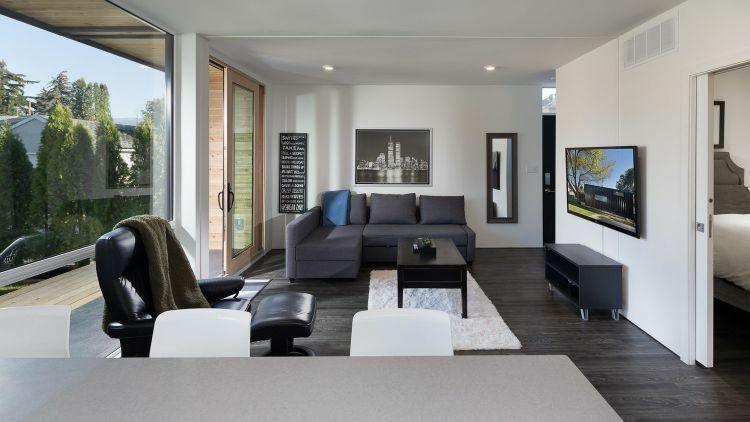 The footprint of the HO3 is 24-by-24 feet, and inside it is a generous 534 square feet. 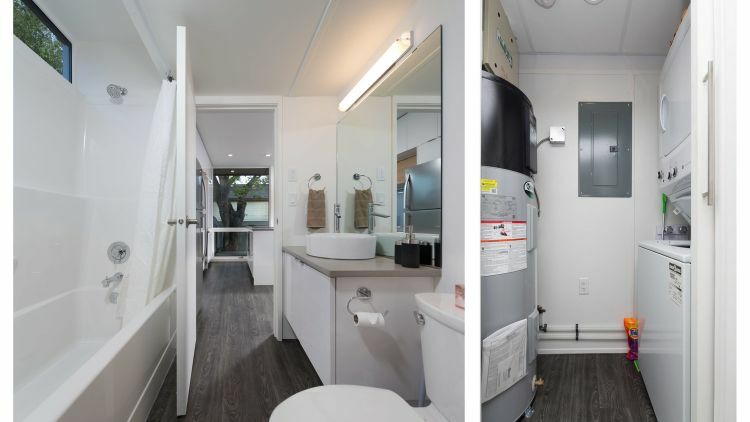 With room for a private bedroom, an island with a kitchen, a full bathroom and a laundry space, the HO3 is designed for luxury while built for practical living. Let's take a look inside. 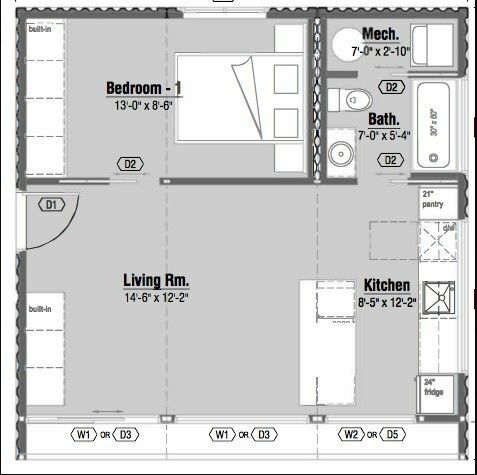 The layout shows how the living room and kitchen blend into one another whereas the bedroom and bath are behind separate doors. Built-in cabinets in both the living room and bedroom provide ample storage. As you step onto the deck of the HO3, the first thing you'll notice is the spectacular 21-foot wide front window beneath the cedar ceiling. 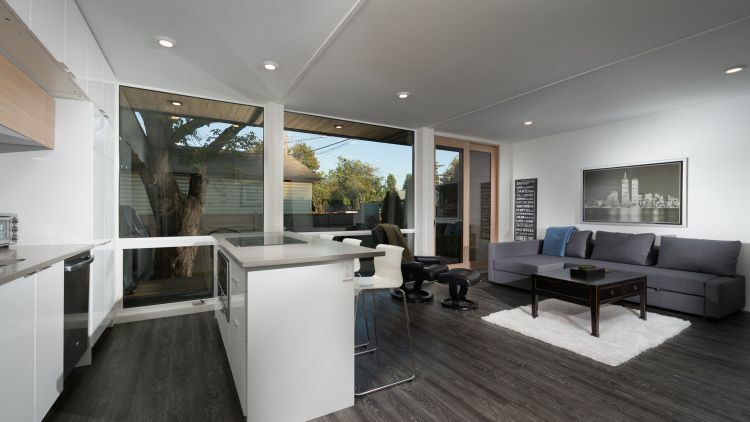 Honomobo wants the homeowner to feel a connection to the outdoors, and this amazing window brings the outside into the living space in a beautiful fashion. The light from the window illuminates this stunning living room and kitchen combination. The flooring is Stonecast vinyl plank, which is exceptionally durable and completely water resistant. The living room has space for a full-size sofa and coffee table as well as an additional chair and ottoman. The open space makes it easy to carry on a conversation from the kitchen with friends and family in the living room. The open door on the right is the entrance to the private bedroom. Escape to the bedroom for a good night's rest and open the window in the morning to let in the natural light. 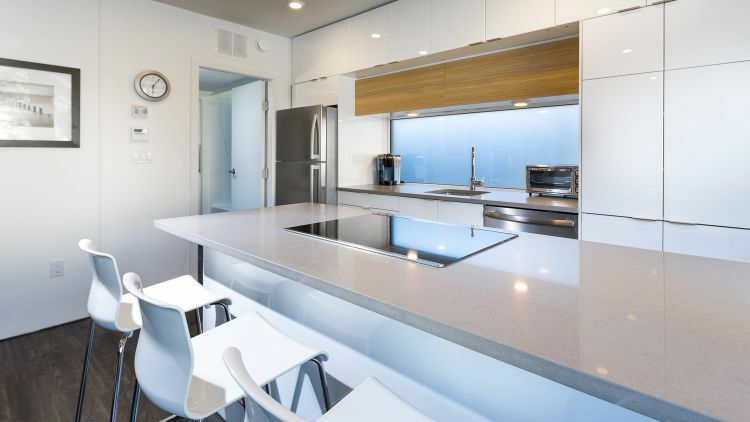 The kitchen is styled in high gloss white cabinetry with a contrasting Carbon quartz countertop and island. The shelf above the sink opens to reveal storage conveniently placed for the cook. Close the cabinet for a clean, sleek look when you're finished. 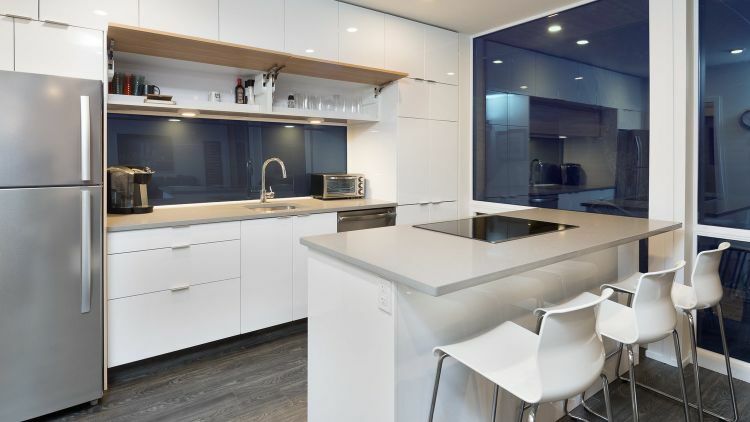 All of the millwork includes white melamine interiors, soft-close drawers and contemporary aluminum edge pulls. The induction cooktop on the large island is the ideal spot to prepare a meal while enjoying the company of friends seated on the three bar stools. The door beyond the stainless steel refrigerator leads to the private bath and laundry area. Natural light pours into the bathroom through a window over the shower/tub combination, and a vessel sink adds a modern touch to the room. Stacking the washer and dryer in the adjacent mechanical room is a convenient way to save space. 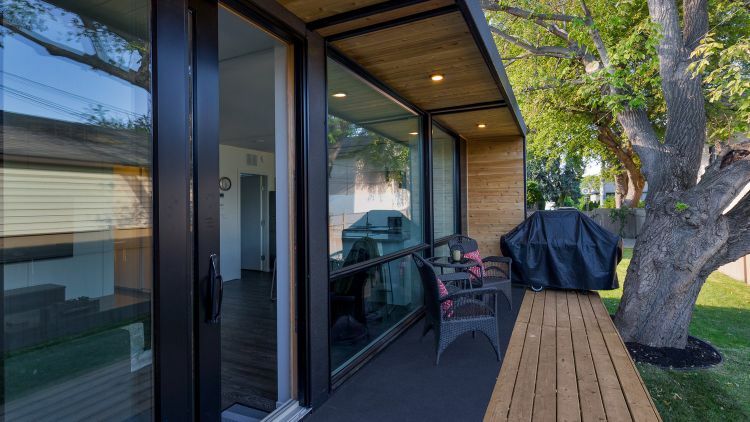 The exterior of the home is made of corrugated corten steel that has been painted with industrial 2-coat epoxy paint. The structure's sturdiness is an indication of its original purpose: "From salt water to freezing temperatures, a shipping container is meant to handle the worst of the worst while protecting some of the world’s most precious cargo," as Honomobo states. This purpose holds true in a HO3 home as well, but in this case the precious cargo is the homeowner and all that this person holds dear.